Sometimes it can be a little sad out here in the culinary world if you are a vegetarian. 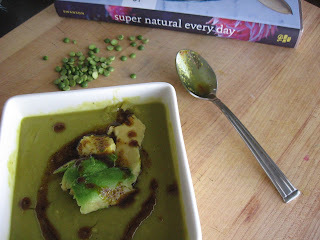 Sometimes a new craze is sweeping all the food magazines, blogs, and restaurants and there is just no way to participate if you are a vegetarian. For instance all things pig are way in right now. I think it may be on it's last leg with its time in the spotlight, but it's still in the forefront. Other times, it's an ingredient, spice, or style of cooking that I can participate in, even if I have to adjust it somewhat. One such dish is shrimp and grits. I think that the southern influence on cooking is starting to pop up here and there, especially in some fancier restaurants. Southern cooking in general is hard for a vegetarian. I see shrimp 'n grits on the menu in lots of places and I want to order it, but you know, minus the shrimp, and then it just doesn't seem worth it. I like grits for just about any meal aside from breakfast, and I have been wanting to try out a hearty, vegetarian version of these grits for sometime now. I hardly ever toot my horn around here, but these grits were GD good. The girls had two more courses to get through in the dinner and they still went back for seconds. If that isn't the best compliment a dish can get than I don't know what is. 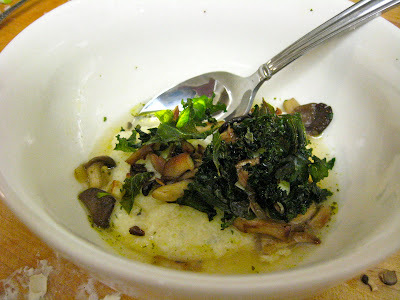 The combination of the creamy grits, sauteed mushrooms, topped with crispy kale chips (partly inspired by my ingrained sense that there must be something green in every meal - thank you mamacita) - all sitting in a little bit of broth are just what I needed to get over my grit craze jealously. I used a fancy mushroom for my dinner party. For this dish I think it is better to buy a smaller amount of a more flavorful mushroom than use more of regular button mushrooms. But, using button mushrooms would taste good too. I also call for white pepper here (my new fav obsession) since it matches the grits, but the black pepper pretty much tastes the same. Go ahead and chop the kale, mushrooms, shallot, and garlic...this will make this dish come together much easier. 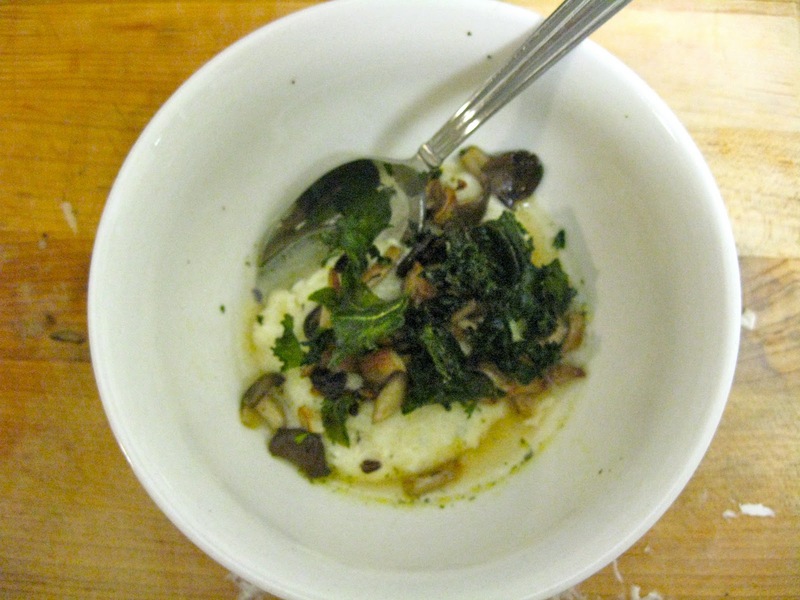 Mix the kale, olive oil, salt, and pepper in a bowl until coated. Place the kale in a single layer on a baking sheet. Once the oven reaches 300 degrees bake the kale for approximately 20 minutes or until they are crispy. Remove and set aside. While the kale is baking, start to make the rest of the meal. First heat up your broth. Once it is warm keep it on a low heat to keep it warm. For the mushrooms heat up 1 Tbs. olive oil over medium high heat in a saute pan. Once it is hot put the shallots in and cook for a minute or two, then add the mushrooms. Stir the mushrooms every minute or two until they start to brown and then add the garlic. Cook until everything is a golden brown and then cover and remove from the heat (or turn the heat down to low when they are almost done to keep them warm until the grits are ready). Then put the milk and spices for the grits into a medium saucepan over medium heat. Sir it constantly to prevent it from burning. When the milk is just about to reach a simmer add the grits and stir until the grits are cooked, about five minutes. Add the cheese and turn off the heat. Stir until the cheese has melted and is well mixed in. To serve put a ladle or two of grits into a bowl. Then add a ladle of broth. Next top with the mushrooms and then the kale (avoid getting the kale in the broth to keep them crispy as long as possible. OMG, just thinking about these grits has me hungry again. You're not just full of it, hey really were THAT good. So glad to have the recipe.